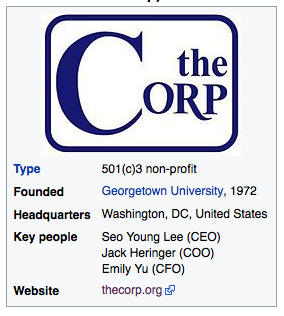 Jack got the job as the COO of "The Corp."
Students of Georgetown, Inc., commonly known as "The Corp" is a 501(c)3 non-profit public charitable organization at Georgetown University in Washington, D.C. It is the largest entirely student-run 501(c)3 non-profit corporation in the world, with seven subsidiary companies generating annual revenues in excess of $5 million. Only undergraduate students of Georgetown University work as employees or sit as members of the Corp's Board of Directors, distinguishing business operations at the Corp from other student-run companies such as Harvard Student Agencies, which allows non-students and alumni to serve as board members.